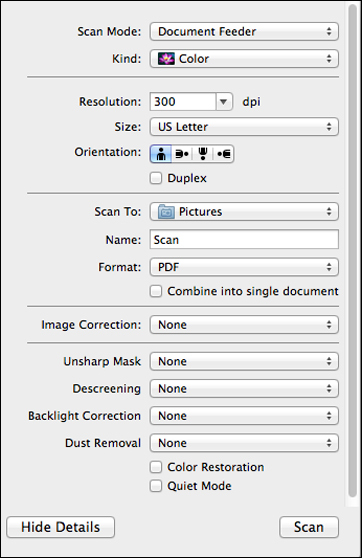 With OS X 10.6/10.7/10.8/10.9, you can scan with your product using an image-editing application such as Image Capture. Open an image editing application, such as Image Capture. If you see the Show Details button, click it. If you are scanning an item on the scanner glass, your product begins a preview scan. Select the Scan Mode setting indicating where you placed your original (if available). Select any other scan settings as necessary. Note: If you are scanning a multi-page document in the ADF, you can have Image Capture combine all the pages into a single document. After all pages have been scanned, you see the message No document loaded. . . . Select the folder in which you want to save your scanned file in the Scan To pop-up menu. Click Scan. Your scanned file is saved in the folder you selected.